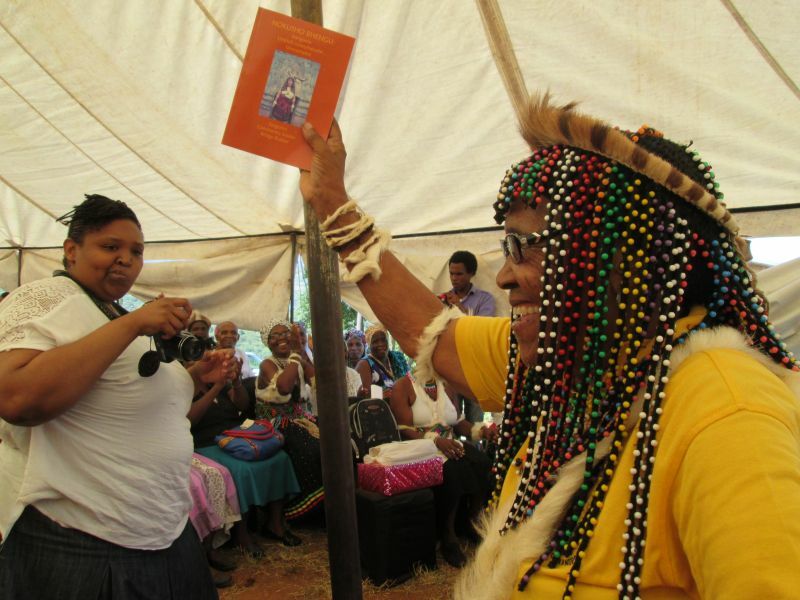 Deep in the Valley of a Thousand hills, the Narrative Foundation gave a book launch to honour 82 year old Makhosi Nokusho Bhengu who has been a Sangoma for 49 years. The launch was traditional and a very colourful affair, with drums, dancing, music,and speeches, Many sangomas were also present, making it very special. The Bhengu family homestead is high on a hill overlooking the Inanda dam. The launch was attended by people from far afield as well as the representative of the Chief, City Councillors and medical people. Makhosi Bhengu was remarkable in that she combined traditional healing methods with Western medicine. The Narrative Foundation who had worked in the Valley for 20 years had intended setting up a clinic that combined Makhosi Bhengu’s traditional methods with those of Western medicine. As this didn’t happen, the Narrative ‘foundation organised to write the complete story of Makhosi Bhengu’s remarkable contribution to the lives of people in the deep rural areas of the Valley. The book tells of how she received her calling and the trials she went through in her life in following this calling. The book is written in both English and isiZulu, making it valuable in both this country and any other country. UmSinsi Press is the publisher. The book will be on amazon.com as an e-book. Currently it is available from the ://www.umsinsi.com website (books). We congratulate Makhosi Bhengu on her wonderful achievements and thank the Narrative Foundation for documenting her life so carefully. Congratulations Mama Bhengu on this feat.I am an honrary son of Mama Bhengu since I first sought her consultation in 2002.She has been very instrumental in providing treatment and other forms of guidance to me during my yearly trips to South Africa from my New York base.I was in South Africa in February when the book was featured in Isolezwe newspaper.I do look forward to picking up a copy during my next trip to South Africa.Kudos for documenting her her knowledge for posterity!